Nearly 30 members volunteered to be part of our Player Development Team. This great response shows their passion for pickleball and our club. Thank you! New classes will begin the first week in October. October offerings will include Orientation for new players, Assisted Play for beginners, 2.5 drills, 3.0 drills and 3.5 drills. Dates and time will be announced next week. October can still be a hot month. To manage the heat, we are trying to schedule drills and classes in the morning or evening when it is cooler. Once it cools off, most Player Development offerings will move to the afternoons. Because there is only so much time and space in the morning, we are going to postpone start of the New Round Robin series until it cools off in late October or November. Thank you for be patient as we figure out our scheduling. Helle Sparre was a professional tennis player and has competed in all four Grand Slams. She was Director of Tennis and a teaching professional for years in California. She caught the pickleball bug a couple of years ago and is now teaching pickleball in Mesa AZ. She is recognized as one of the best pickleball instructors in the nation today. We are excited to have Helle here on Saturday and Sunday November 17 and 18. She asked for small one-hour classes of 3 to 4 people. Mark your calendars and find your foursome and be prepared to experience a lesson from one of the best. These instructors are usually here 1 to 3 days and are on the courts teaching 6 to 10 hours a day. We like to provide them with a place to sleep, either casita or private room, and make sure they have meals, especially breakfast and lunch during their breaks. If you are willing to be a host, please contact Jean Bustard at jeanb@dcmesa.com. We currently have four professionals scheduled to visit between November and March, we already have a host for March. Thanks to Dave Thomas, John Sicardi, and Gary Mencimer for maintaining the pickleball courts. Just a reminder that the Onix balls are changed out on a regular basis, so the court maintenance team is always replacing old worn out pickleballs with new balls, which the club purchases. Please don't remove these balls from the court, or hold onto them for future play. If you come across any balls that have lost their bounce, please put them in the bins next to the courts. 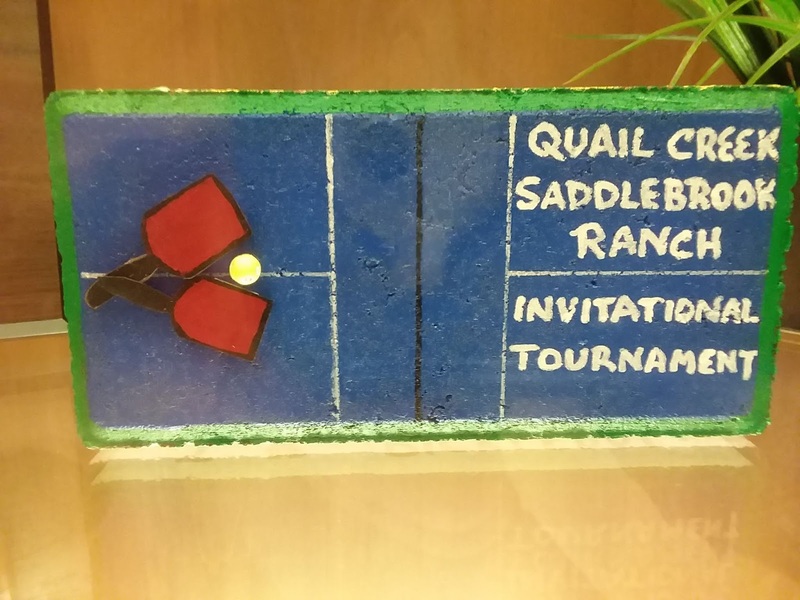 The famed "Brick" trophy is ours to win again on October 25th in the Saddlebrooke Ranch/Quail Creek Invitational. 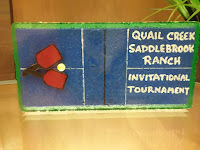 If you are interested in playing in the Saddlebrooke Ranch/Quail Creek invitational please sign up in the appropriate category. You and your partner must be a member of the QCPC to play in this event. Please sign up in your event based on your IPTPA/USAPA rating. You may sign up to play in two events. Not all teams will play, depending on the number of teams from each Association. Please pick your own partner and sign up together using the comments field to list your partner. Teams will be used in order of signups (If Saddlebrooke only has 2 teams in Womens Doubles 2.5, the QCPC can only have 2 teams, even if 4 teams sign up). In the Invitational you will not play against other teams from QCPC. Mens Doubles/Womens Doubles will be held in the morning with Mixed Doubles being played in the afternoon. Our next social will be on Wednesday, October 17th. Club members of all skill levels are invited to attend. Details about the social will be made available in a later newsletter. QCPC is seeking a few good men and women to help out with various club activities. The first two slots are standing committee chairpersons. Communications Chairperson - Communications Chairperson shall oversee publicity, email communications to members and potential members, web-site updates and postings on the bulletin board at the courts. The Communications Chairperson will submit articles to Quail Creek Crossing and news of events to What’s Happening (but we alrady have two people to do this); send newsletters to the membership monthly, or as needed; coordinate with the Membership Chair for updates; and insure the that bulletin board is neat and contains up-to-date information (but we have a bulletin board organizer who does this). Will probably serve on the QCPC Board. Social Chairperson(s)- The Social Chairperson (or Co-Chairpersons) shall coordinate social events for the Club, usually by appointing other individuals to actually organize the events. During the winter months, the Club shall have one social event per month. These will usually involve pickleball activities followed by potluck meals, appetizer or dessert events, or whatever format is desired by the Social Chairperson(s) and Event Organizers. The QCPC will provide plates, napkins, plasticware, and other essentials for the events, and, in some instances, the QCPC will provide some of the food. Will probably not serve on the QCPC Board. Round Robin Coordinator- We need someone to organize the QCPC Wednesday morning Round Robins. The RR Coordinator does not necessarily need to run the Round Robin each time, but would need to find volunteers to run the Round Robins when he/she doesn't. We have been having volunteers run the Round Robin for a month each during the summer, which seems to work well. Don't know how to run a Round Robin- no worries- it is easy and we can quickly teach you. Contact President Steve Shapiro if you are interested in one of the three positions listed above, sshapiro57@gmail.com, or 274-4150.